When you think of a victor, do you think of a soldier fighting in a war or maybe even a boxer in a bout? These of course are victors if they win, but everyday people also can be victors. It is all in one's mindset and attitude. The enemy or opponent in everyday life could be financial stresses, a sudden illness, social or emotional problems, a toxic relationship - all manner of things that come upon humans as they progress through life. Now, I want you to think about yourself. How do you think when a struggle or problem comes along? Do you have any of the following thoughts? These are self-defeating or victim mindsets. If you say these, your thought is that the situation (whether it is a person, an illness, a circumstance) has control over you and it is the cause of your unhappiness. This isn't a healthy mindset to have. A better mindset to strive for, is the victor mentality. What this means is that you are in control of the situation, and you control how you handle it, your feelings and levels of happiness. Victims make themselves feel better by making excuses for their problems, whereas victors won't waste energy making excuses. 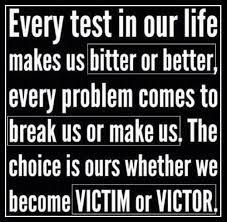 Instead victors will strive to find a good way out of a bad situation. Victims focus on outward pressures, while victors focus on inward confidence. Victims will only see the problems around them, whereas victors will look within themselves to find solutions and carry on. Victims feel defensive and discouraged, while victors feel motivated to get to work. When tough times come, victim will just feel bad about themselves, whereas victors will want to find ways to fix the problems, and be proactive. Victims always feel attacked, while a victor feels pushed by people to do greater things. Criticism or helpful constructive feedback is taken negatively by a victim, whereas a victor will be inspired to become a better person. As a child growing up, I was constantly bullied about my face and told by society that I wasn't welcome due to looking significantly different. I was a victim of society's prejudices. But what did I do? To be honest there were times when the victim mentality surfaced - I had the 'life is unfair's and the 'why did this have to happen me? 's and 'I hate looking like this's. But these attitudes did not stay forever. Instead I took on a victor mindset (which I didn't know anything about), and focused on showing the world that I had value, and I had every right to be out in the community leading an ordinary life. I worked hard, I was determined, I had goals and I continually tried to better myself. These attitudes and attributes of my personality have stayed with me to this day. As a perfectionist, criticism can hurt, but again I use it to make myself better. I like this meme. Absolutely don't stay silent and use your pain, don't let it use you. This is something I am trying to do as an author and speaker. In your everyday life, when struggles come, as they will, take time to think about your mindset and your attitudes towards them.. Will you sit there and just take it? Or will you take the bull by its horns, as they say, and look at the problem with a 'I'm not going to let this defeat me!' mentality, and then set goals and plans in place to attack it?